The information on this page relates to applying a LANSA license at V14 Service Pack 1 level or above. 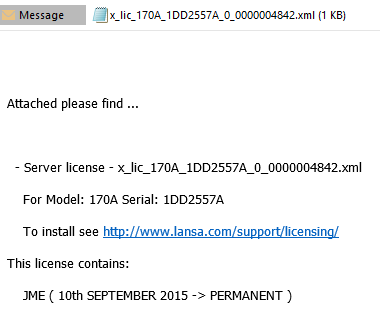 This involves adding the license code you have received from LANSA Licensing to an existing license file in your LANSA environment (or creating a new license file if it doesn't exist). This type of LANSA licensing generally applies to server licenses, for example, LXX (superserver), DEV (iSeries Development), CLT (LANSA Client), WEB (Web execution). Note: The license you have received is only valid for the CPU that you have requested it for. This is also known as softkey licensing. Applying this license involves placing the Software Key License file in a designated location so that LANSA can read it. The file must follow the correct naming convention. 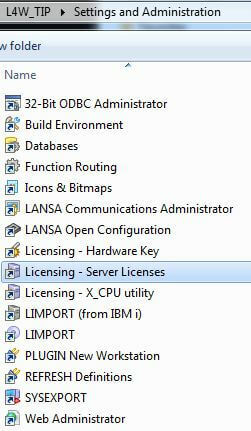 From the LANSA folder, Open the Settings and Administration folder and select the Licensing - Server Licenses shortcut. The user interface for V14 SP1 has changed. New in V14 SP1 is a license file location, which can be local or shared. There are 3 license screens ...Applied, Add Licenses and Advanced Settings. The Applied tab sheet will indicate whether the active license file location is Local or Shared. If this is a new V14 installation, no licenses will be listed yet. File Location - Active This attempts to load the license file for the current LANSA environment. If a license file exists locally, this will be loaded. If there is no license file locally, the shared location will be searched for a license file (refer to Advanced Settings for the Shared location details). File Location - Local This attempts to load the local license file. The Local location defaults to <root>:\x_win95\x_lansa\ where <root> is the current LANSA system. File Location - Shared This option indicates if a license file exists in the location specified as the shared location. A shared license file can be accessed by more than 1 LANSA system on the same CPU. File Location - Other Selecting Other allows you to navigate to a location where a license file exists for any CPU and loads the licenses for review. Delete Selected This allows you to deleted 1 or more selected licenses from a license file, for example, expired licenses or duplicates. Care should be taken when selecting and deleting licenses. This screen allows you to navigate to a location and select an XML file containing licenses to be applied. Save to File Location Active When you apply licenses with Active selected, they will be added to the license file that is Active. Save to File Location Local When you apply licenses with Local selected, they will be added to the license file for the current LANSA environment..
Save to File Location Shared When you apply licenses with Shared selected, they will be added to the license file in the location specified for Shared in Advanced Settings. Save to File Location Temp When you apply licenses with Temp selected, a license file will be created in the %TEMP% location. If a license file for this CPU already exists in %TEMP%, they will be added to the license file. Save to Location Temp is useful if you are generating license files for other CPUs. Note: If you have any expired licenses, for example, expired temporary licenses, you should use the Delete Selected button to remove them. The list of licenses on this screen should only include valid, unexpired licenses. Refer to Cleaning up of unwanted license records for further details on License Maintenance. Allows you to review and set default locations for license files. The current Shared location is displayed at the top of the screen. Set the location for shared LANSA license location. You can set the location of where you want the Shared license file to be located. This might be an existing LANSA location or the default LANSA Common location: C:\Program Files (x86)\Common Files\LANSA. You can type in a location or use the button to navigate to a location. Default If you wish to set the Shared license file location to the defaut, you can select the Default button, which sets the shared LANSA license location to C:\Program Files (x86)\Common Files\LANSA. If you now go back to the Applied tabsheet and select Shared, the new location set in Advanced Settings will be shown. Copy This option allows you to copy the LANSA license file from the set Shared license file location to the Local license file location. This is useful if you install a new Visual LANSA configuration and you only want to add licenses to this configuration. A Copy message box will be issued asking if you wish to proceed. Move This option allows you to move a license file to the shared location. This option is useful if you applied a license locally but want all Visual LANSA configurations on this CPU to access the licenses. A dialog will be issued asking if you wish to proceed. If no license file exists in the location you are moving from (or if you have already moved the license file from this location), the move will fail and a message will be issued. Note: If the licenses are to be applied to a Windows server running the LANSA Listener, you must stop the listener before adding LANSA license codes and restart it again for the new license codes to be recognized. The x_lic_*.xml file you receive from LANSA licensing should be copied to this IFS location. You IBM i administrator can provide the steps to move a file to the IBM i IFS. The most common methods are to use the QNTC file system, AS/400 NetServer or iSeries Navigator. QSECOFR user profile or partition security officer profile for SYS partition. All current licenses will be listed with their status. Note: If this is a new V14 install, you will see a standard list of 7 day temporary licenses which are provided with the new install. Select F6 to launch the Request New License File screen. On this screen, you need to enter the full IFS path to the license file, including the license file name, as per the screen below. Hint: To avoid mistakes in the path, use WRKLNK to navigate to the location and press option 5 to view the XML file. Then you can copy the full path from the Browse field at the top of the screen and paste it into the New License File Path. After pressing Enter, the New License screen will be re-displayed. Existing and new licenses will be indicated. Press F6=Apply to apply the licenses. Your license file will be updated with the new license codes details. 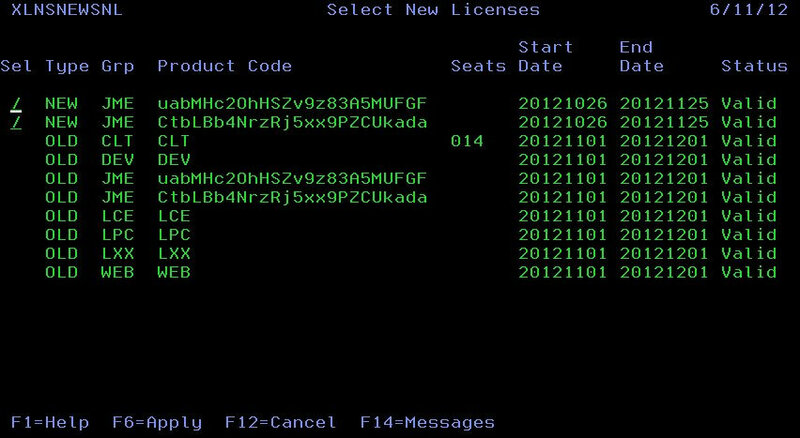 Note: If you have any expired licenses, for example, expired temporary licenses, you should use the F22 Delete function key ont he main screen to remove them. The list of licenses on this screen should only include valid, unexpired licenses. Refer to Cleaning up of unwanted license records for further details on License Maintenance. Copy the supplied file to a temporary location on your hard drive. Note: A lansakey.txt will be installed as part of a Visual LANSA installation; you should elect to replace the default lansakey.txt with the version you have received from LANSA Licensing. Start Windows Explorer and confirm that the lansakey.txt file is present in the same LANSA folder as the LANSA.EXE. Note: These steps must be performed on the CPU that is nominated as the License server. Request your V14 License Server license(s) by providing the CPU details of your License Server CPU. When you receive your lservrc_<CPU>_<Serial Number>_<Date>.txt file, copy it to a temporary location on the License Server PC and rename to lservrc (no extension). Right click on the lservrc file and open with Notepad. Copy the contents and paste them into the V14 lservrc file from step 2. Note: Append the contents to the existing contents, do not override the current contents. This version of lservrc now contains the V14 and the pre-V14 license information. Save this file and copy this file back to the default location in step 3. You can replace the existing lservrc (you may decide to rename the existing lservrc file to lservrc_pre for backup purposes. At this point you can open pre-V14 and V14 Visual LANSA using the same License Server.